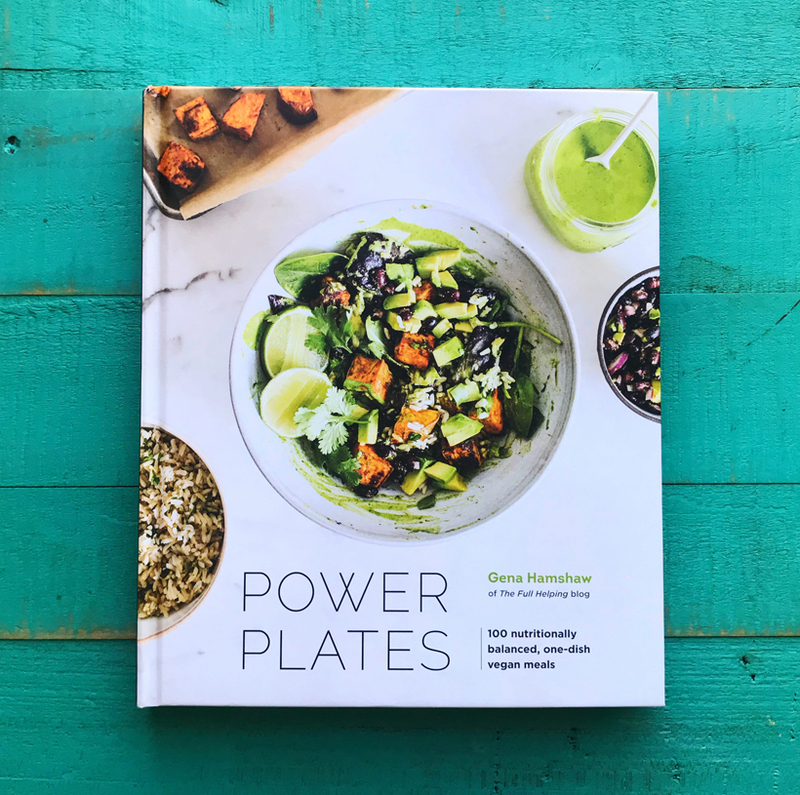 Power Plates Cookbook by Gena Hamshaw + a recipe from the book. 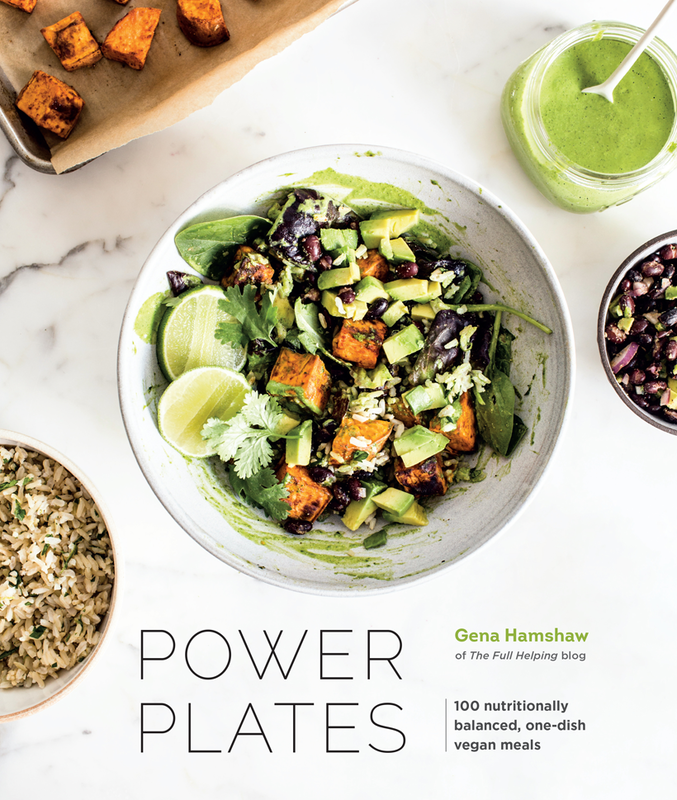 Today I get to share with you guys an awesome new cookbook by my good friend Gena Hamshaw, Power Plates! Raise your hand if you already know and love Gena Hamshaw?? Yup, I am guessing there are a lot of raised hands out there. 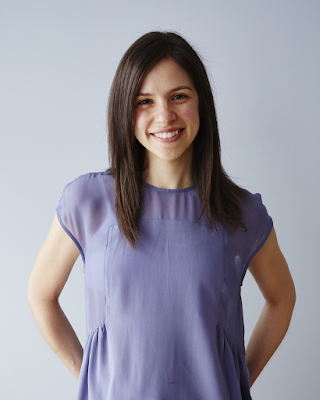 Gena has been in the blogging world for many years and has been pumping out some of the most genuine and heartfelt + practical and nourishing content for years and years. From recipes and life stories to special features like her "Weekend Reading" posts, Gena's blog The Full Helping is definitely one to put on your blog-browsing rotation. I met Gena, gosh, nearly eight years ago! Wow, time flies guys. We met at a blogging event in California - and we were able to connect even closer than the usual hello's and goodbye's of those massive brand-hosted events because we were both vegans, we both lived back in NYC (at the time) and we both had a history of eating disorders. Needless to say, I have been beyond lucky to have Gena's genius advice, sassy wit, loyal friendship and creative talents in my life for these past years. Power Plates. 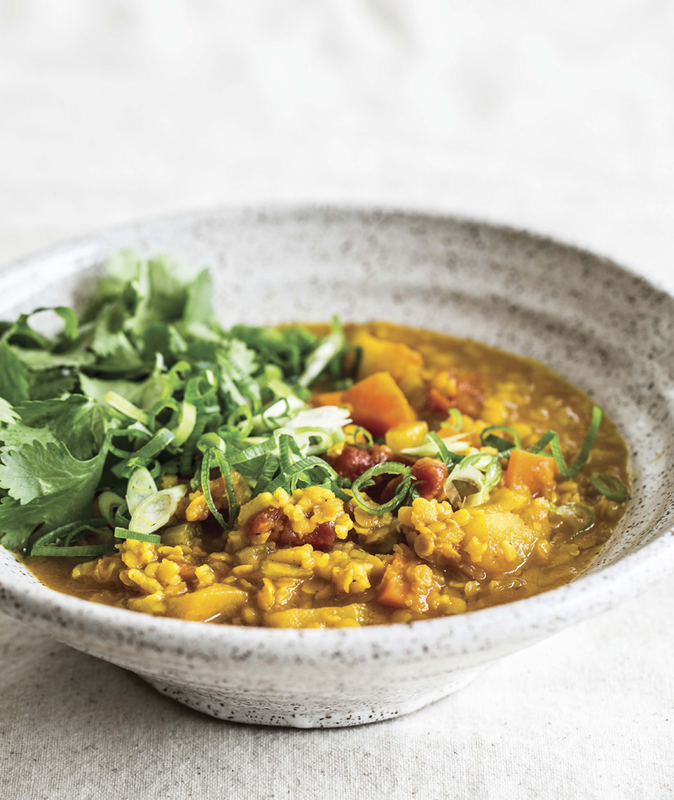 Power Plates offers up 100 nutritionally balanced, one-dish vegan meals. Every recipe contains key healthy fats, complex carbs, and proteins, which together make for a full meal -- things like Macro Bowls (love those! ), Warm Tofu chop Salad, Balsamic-Glazed Tempeh and Veggies over Soft Polenta and many many more inspiring dishes. 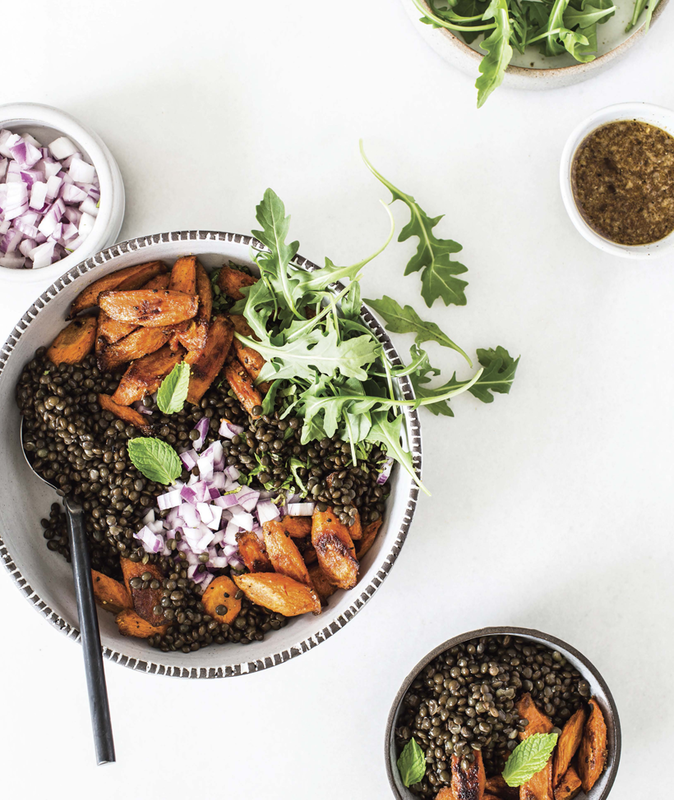 * Masala Lentil salad with cumin roasted carrots. 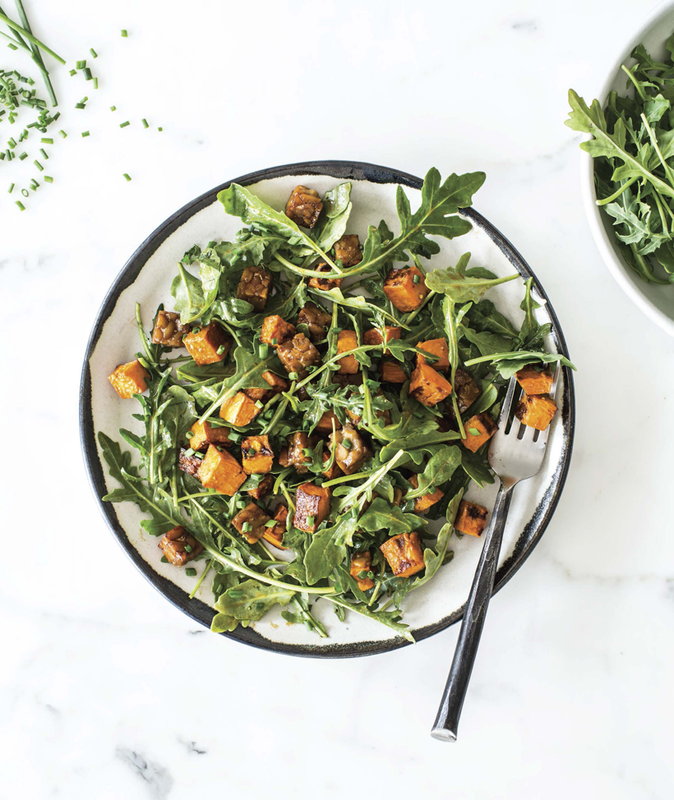 * Sweet potato salad with tempeh and maple mustard dressing. My Must-Try's!.. 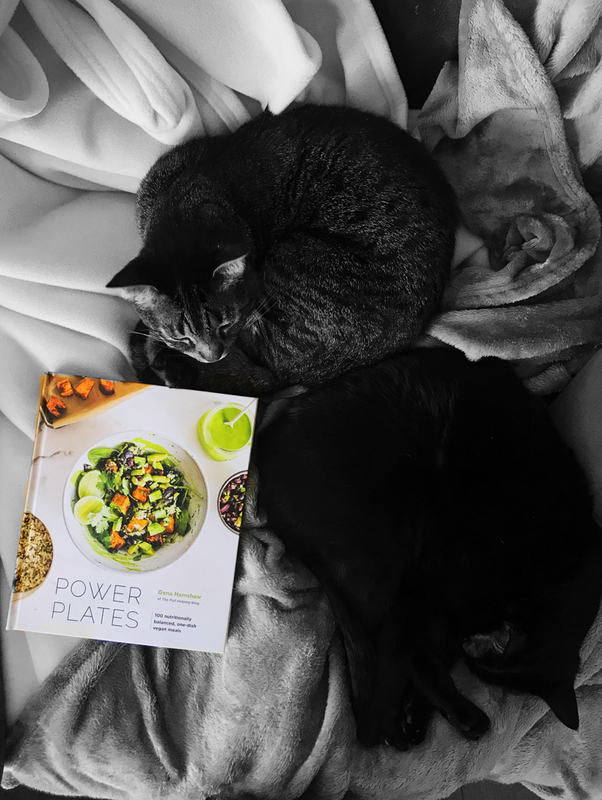 After a few indulgent flips through Gena's Power Plates cookbook, these are the five recipes that really caught my eye.. This sounds like my kind of comfort-food rice bowl. I am LOVE with the idea of making a creamy rice using cashew cream. And the peas add a bonus of color, protein, texture and sweetness. This just sounds so freaking fantastic. Healing, warming, inviting, colorful - so many intense flavors in a sizzling skillet. And this fried rice is actually incredibly healthy. Maybe it is because it is still technically winter, but I am in love with the entire super creative and hearty soup section. It can be challenging to make soup into a beautiful meal, but Gena's Power Plates recipes do just that! I love the look of the thick and creamy Tortilla Soup (swoooon! ), also that rustic White Bean Ribollita and the warming West African Peanut Stew. I absolutely adore vegan baking. And I am always looking for new ways to pack some serious nutrition into my muffins and loaves without compromising the delicious textures and flavors. Well these muffins do just that with their shreds of carrot, oats, walnuts, raisins and apple. These Deli Bowls are so fun! I love this idea of adding a bunch of deli-style vegan salads and creating an easy go-to lunch or dinner bowl. The chickpea salad with scallions, capers, vegan mayo and Dijon sounds so flavorful! ...but seriously guys, I could barely narrow down five fave things because the bowls in this book all look so fantastic! - If you are not vegan and just looking to add more plants to your diet. 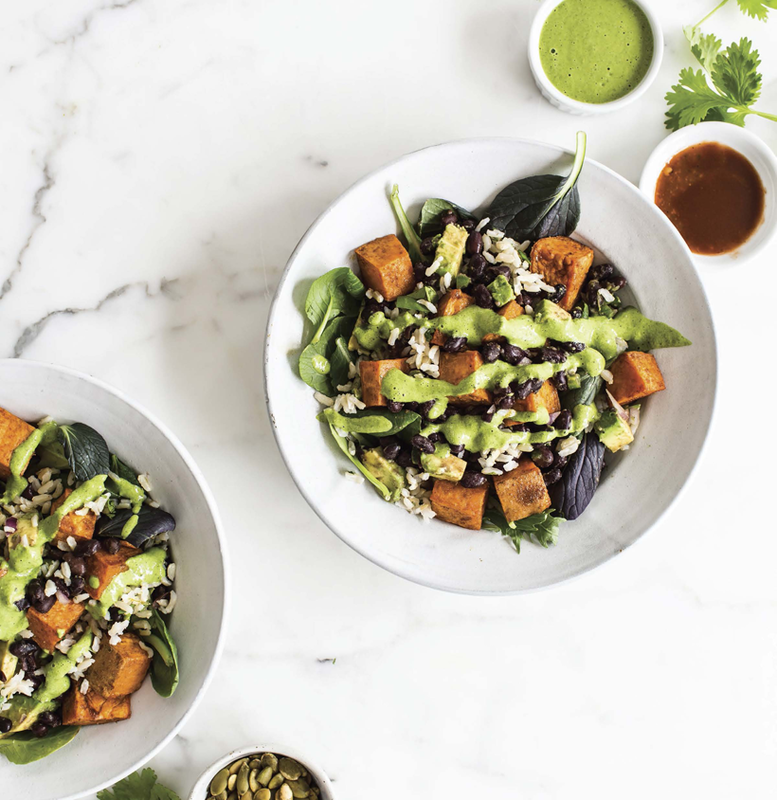 - If you are vegan and looking for go-to one-bowl recipes that are nutritionally balanced + delicious. - If you have no idea what you are looking for in a cookbook, but just really want to get inspired and excited about healthy cooking. - If you love looking at jaw-dropping food photos. - If you want a gorgeous coffee table-worthy cookbook. - If you want to give the gift of health + delicious cooking to someone. Gift-approved! - If you like eating delicious food. So, get your hands on this book ASAP so you can see exactly what I mean. 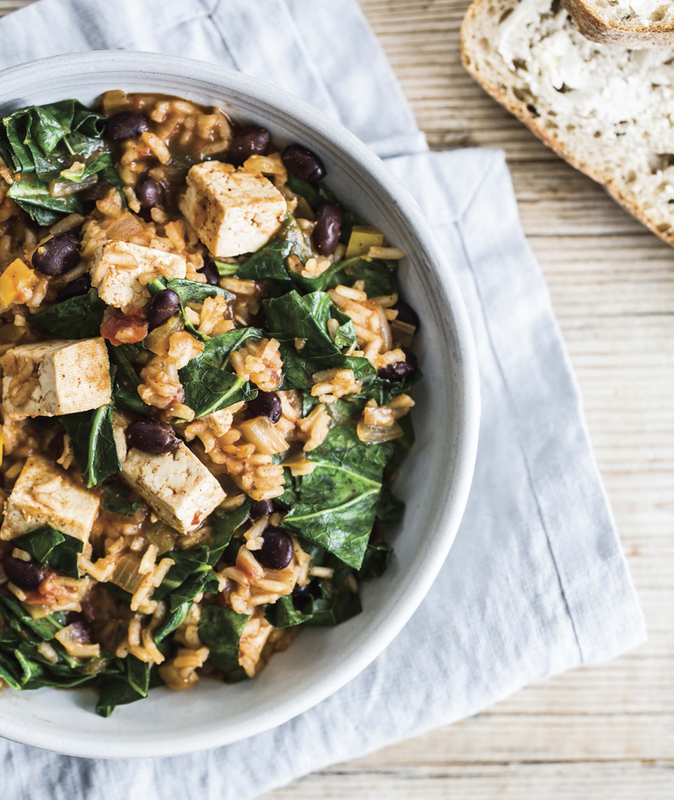 * Rice, beans, tofu and greens. 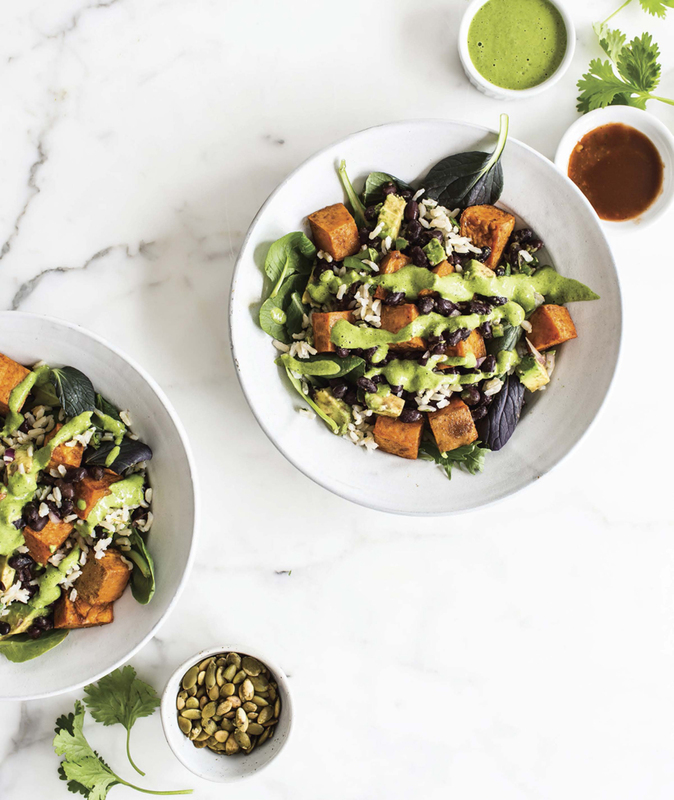 I love every part of this dish: the spice-rubbed sweet potatoes, the rice flecked with lime zest and cilantro, and the tangy black beans enhanced with creamy avocado. When served over fresh greens, they add up to a perfect summer meal. Combine all the ingredients in a blender (preferably a high-speed blender) and process until totally smooth. If the sauce is thicker than you’d like, add another tablespoonful of water.